Being a MSP requires you to be agile and on your feet all the time. Hence we've brought you Desktop Central MSP mobile app (for both android and iOS) through which you can now start managing your desktops and servers from anywhere, any time, and perform activities such as installing agent on a new computer, to retiring computers from the network. 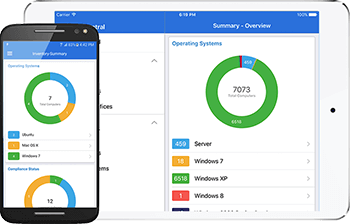 Desktop Central MSP's mobile app can be used to manage Windows, Mac, and Linux computers. With just a click you can install or remove the Desktop Central agent from Windows, Mac, and Linux computers. Learn more. We bring you the power to initiate scan any and all computers which you're managing and fetch details instantly anywhere, anytime through our app. Learn more. Collecting details of installed software on managed computers has never been this easy. Get all the data right on your smartphone's screen. Learn more. Get up-to-date computer details based on the manufacturer, device type, age and more. You can also view indepth hardware inventory such as RAM, ROM, HDD, etc. Learn more. Now you can prohibit software right from your smartphone. Use the app to scan and identify computers with prohibited software and uninstall it automatically. Learn more. Add new computers to manage or remove them if they've completed their lifecycle using our app's Scope of Management (SoM) functionality. Learn more. Automate all your patching activities for Windows, Mac, Linux, and 3rd party applications. Learn more. Initiate remote sessions, troubleshoot computers from anywhere, any time. This ability is limited to iOS devices. Learn more. 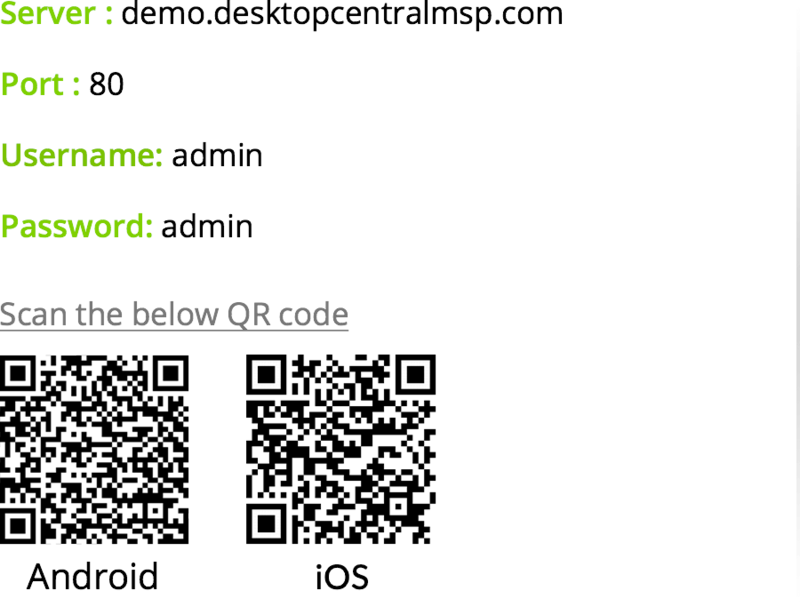 You can download the Desktop Central MSP mobile app from the Play/App Store or scan the QR code provided below. Desktop Central MSP mobile app is currently available for both iOS and android devices. Access to the contents in the mobile app is determined by the role and permissions for every user. For example, if a user has read only role in Desktop Central MSP, his/her access will remain the same in the app. Download the mobile app by searching for "ManageEngine Desktop Central MSP" on the app/play store, or by scanning the QR code provided below. After downloading the app, you can access it by providing the details of your Desktop Central MSP server. You will have to use the same login credentials to login to the mobile app. Eliminate wait time, to resolve help desk issues.